The serial car thief who killed a Horsham grandmother when he crashed into her car at up to 142mph said he wishes he had died instead. 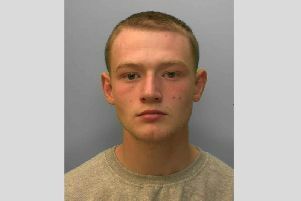 Conor Dobson, 23, was jailed today for 15 years for the manslaughter of 70-year-old Rebecca Nevins. Click here to read the full story. In a statement read out by his lawyer at Hove Crown Court Today, Dobson said sorry to Rebecca’s family. He said: “I want to open this by firstly apologising to the family of Rebecca Nevins for the grief and devastation they have suffered in the last few months. He said he accepts I accept total responsibility’ for the ‘terrible accident’. Dobson added: “I wish it had been my life. Dobson also said that being unable to see his young son while he is in custody has taken a toll on him. Also speaking in court were Rebecca’s grieving daughters Alice and Philippa.